Thailand’s Royal Interpack is claiming a first in the country with its fully integrated PET bottle-to-food-grade flakes system. But it has set higher stakes: whilst currently processing up to 80% rPET sheet it is aiming for 100% rPET usage in its sheets. Set up five years ago to thermoform punnets and clamshell packaging for the fresh fruit/vegetable sector, the firm (a member of the Royal Group Thailand) expanded to sheet production and thereafter into recycling. “We went into recycling to meet our customers’ demands and because it closes the loop in PET bottle recycling,” said Radhika Chawla, Director of Finance. “Now, we source the bales, process the flakes, produce the sheets and thermoform into packaging. We are utilising the latest extrusion technology that works to remove all impurities and create a FDA-approved, food-safe plastic that can be made into our full range of clamshells and punnets for packaging fruits, vegetables, mushrooms, tomatoes, cut fruits, salads and more,” said Radhika. “We also went into recycling so that we will be able to control the consistency of the regrind,” she added, explaining that the facility has a capacity of 1,000 tonnes/month and will be expanding the regrind output to 1,400 tonnes/month. The food trays are mainly destined for export markets such as the US. The firm also has a facility in California where it processes the flakes into PET sheets and food trays. It is currently also producing 100% rPET clam shells in the US by sourcing FDA-approved rPET sheets from US suppliers. “We have also added new product lines in the US facility and are already producing PP deli cups,” said Radhika. Meanwhile, the Thai plant will be producing 100% rPET sheets by June this year. “Currently, we use up to 80% rPET in our sheets, but are aiming for 100% rPET sheets,” said General Manager, Somendra Mishra. The 100% rPET sheets will be made through the use of a FDA-approved vacuum extruder that is being built by German machinery maker Daimat, according to Mishra. Radhika who owns the facility, together with her husband Visanu Chawla, says the recycling line was commissioned in August 2012 and started up end of last year. The 200,000 sq ft facility in Chonburi, about a two-hour drive from Bangkok and ten minutes from the seaside resort of Pattaya, sits on a 32 acre-site, of which only 40% has been developed. 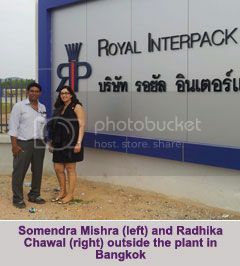 “We invested US$25 million in the plant and machinery to get the integrated line going,” said Radhika. Lee Chee Kiong from sorting equipment supplier S+S Inspection Asia said, “The line includes an S+S optical sensor-based sorting system and high frequency electromagnetic metal detectors. 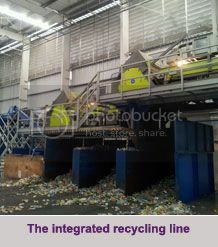 The first two automatic sorting systems were employed to sort the complete bottles while the third sorting system just before packing is for sorting of flakes (size of 3 x 3 mm and above). The system also includes a label remover, wet granulator and a PET flakes washing system from STF in Germany. Besides the FDA, the firm is accredited to the British Retail Consortium (BRC) IOP and ISO 9001:2008 standards.